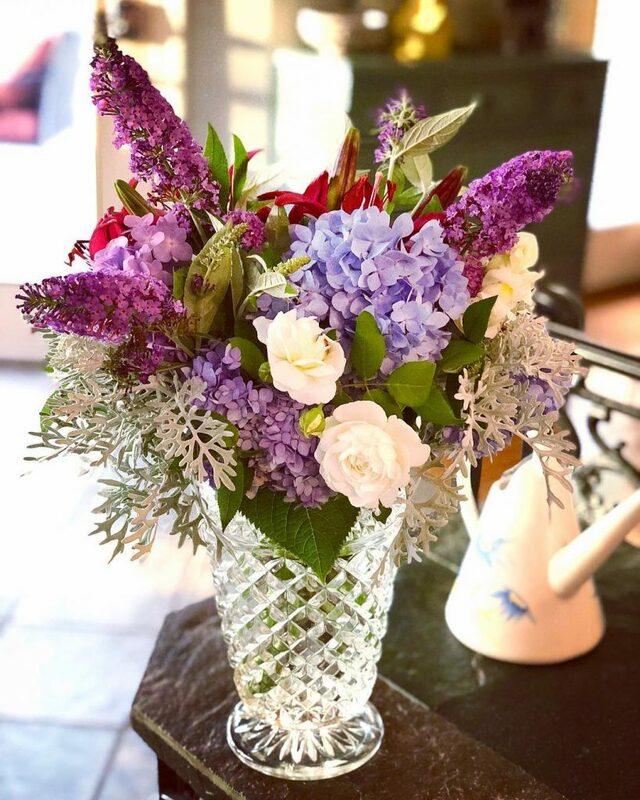 One of the most rewarding things in my life is heading out into my garden with a pair of scissors and cutting myself a huge bouquet of fresh flowers. I guess that tells you just how boring my life is these days, huh? 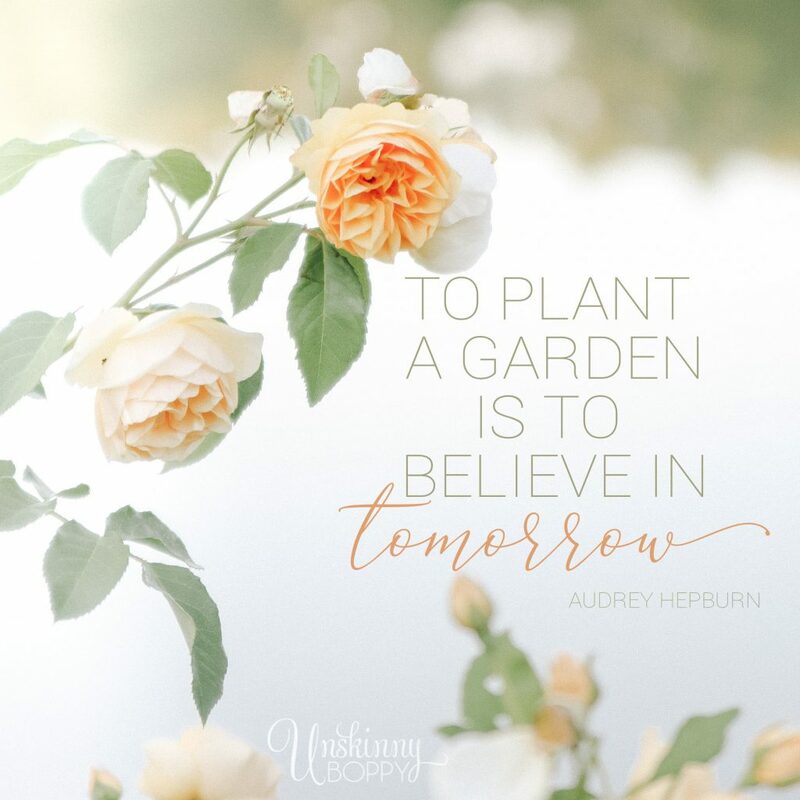 Over the years, I have purposefully planted my yard with flowers, trees and shrubs that bloom all year round so that I always have something fresh growing to brighten up my home. When that “Pick a flower” day comes around during Teacher Appreciation week, I am ready. I try to grow perennials so that I only have to plant them once and they come back year after year, giving me free flower bouquets for a long time to come. The return on their investment is priceless. 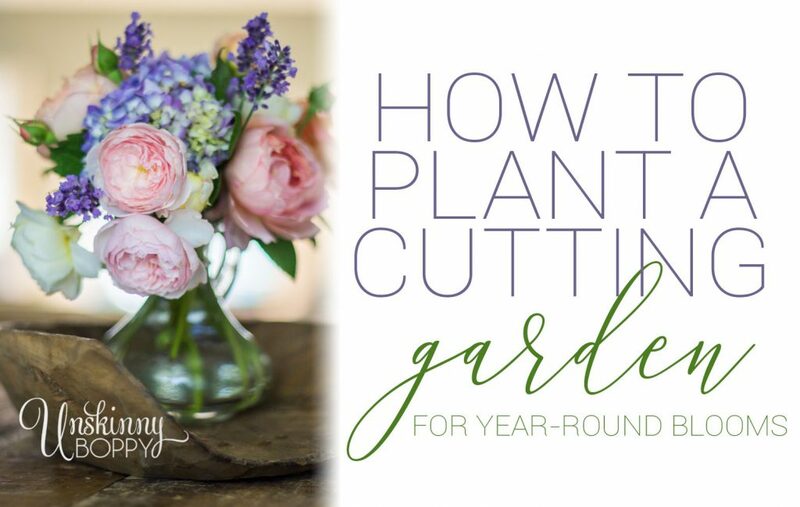 Today I’m sharing all of my favorite plants to grow for gorgeous cut-flower arrangements all year round. 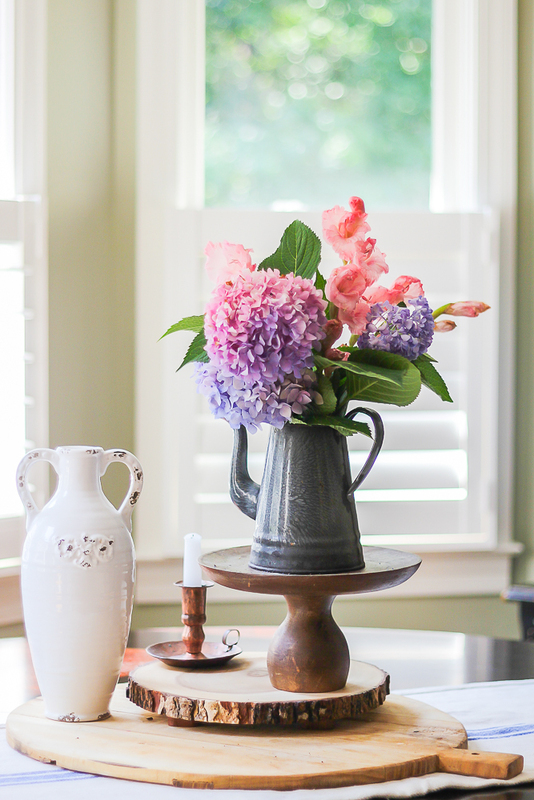 First off, let me say that my absolute favorite flowers to use in arrangements are hydrangeas. 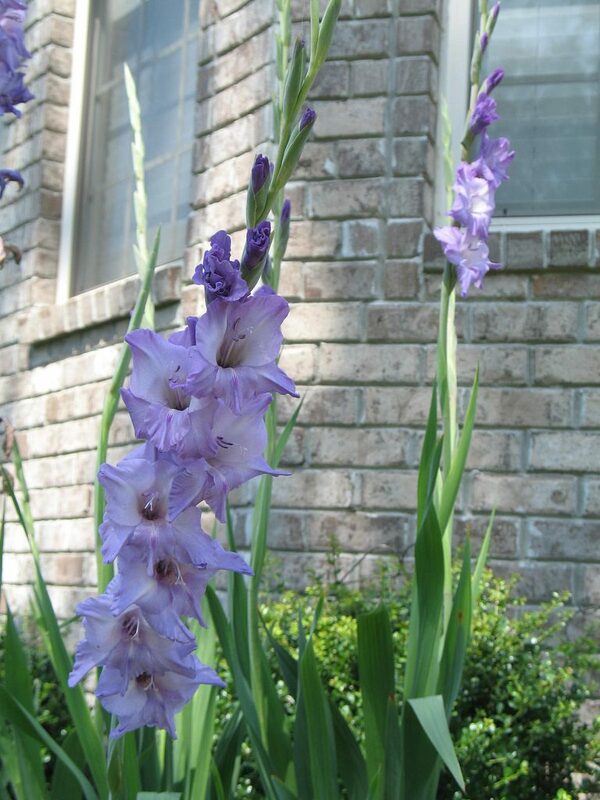 These big ol’ hardy bloomers last all summer long and they come in shades of pink, periwinkle, purple and light blue. Their extra-large floofy heads fill a vase quickly and last a really long time. 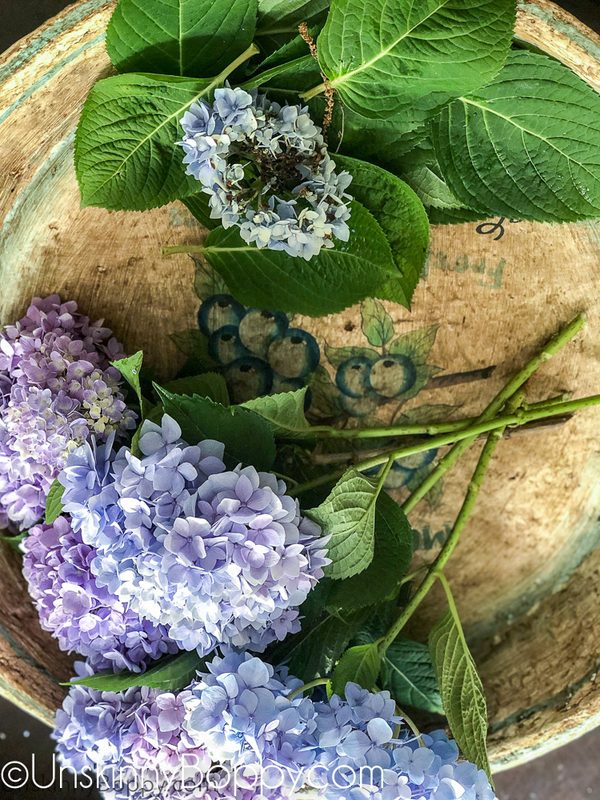 My best tip is to allow the water to evaporate completely from the vase of hydrangeas and then you can let them sit and dry out for beautiful dried flower arrangements as well! It’s the gift that keeps on giving, Clark. Now, let’s talk about which flowering plants produce the best blooms for every season so that you can start your own cutting garden at your house. In springtime, it gives me great joy to see the first flowers burst forth from the ground after a long, cold winter. The first things to bloom in my yard, without fail, are my daffodils. 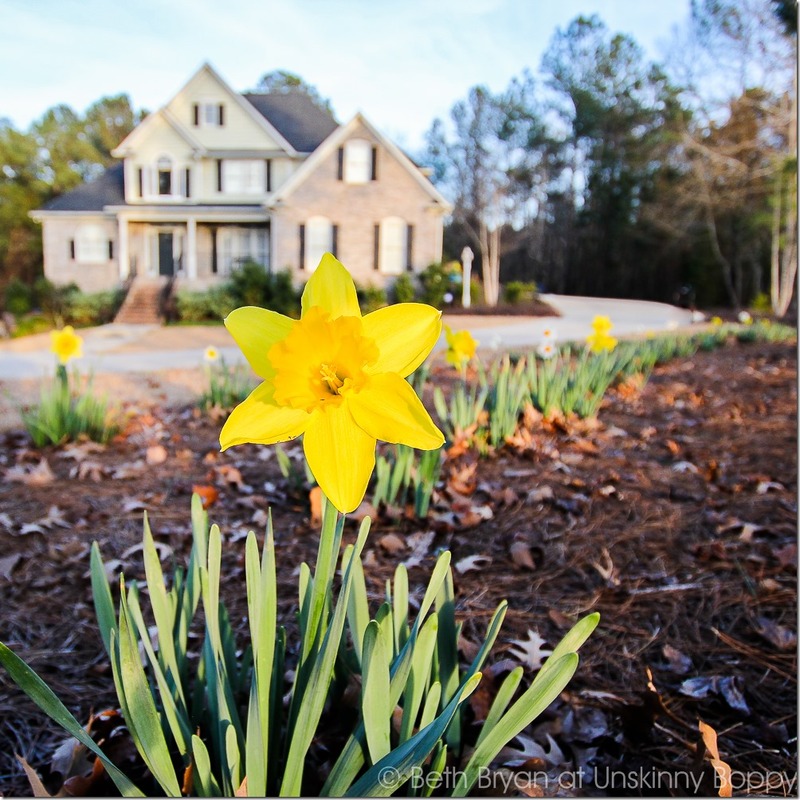 Here in Central Alabama my daffs sometimes pop up seemingly overnight at the first hint of warm weather in mid to late February. They are like a ray of sunshine when everything else is still dreary, dead and cold. 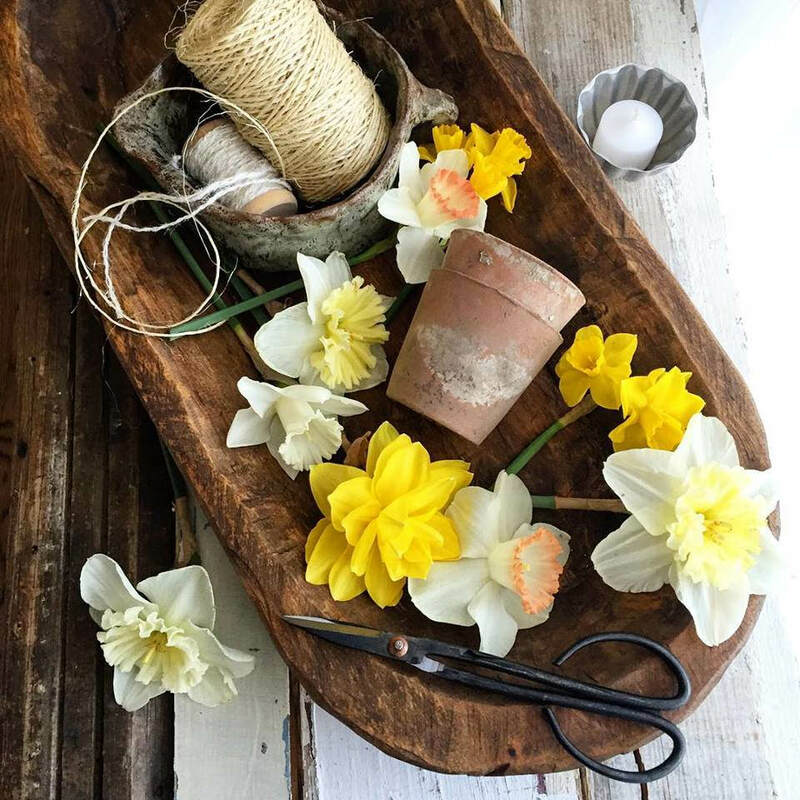 By March the daffodils are in full bloom, along with the other quick bloomers like tulips, forsythia, azaleas, hyacinth, dogwood and bearded irises. I call them “quick bloomers” because these early Spring plants only bloom for a few weeks each year, usually around Easter time. But take heed, gardeners! Do NOT let the fact that you only get a short window of blooming opportunity dissuade you from planting them in your garden. These plants are WELL worth the effort to get some glorious cut flowers during those few weeks each year. 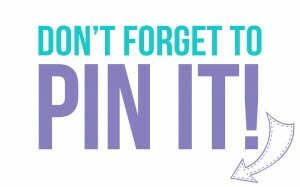 Just be sure to make lots of arrangements and enjoy them while they last! Usually you’ve got a 2 to 4 week window with these early bloomers. After all the quick bloomers of Spring wilt away, the crickets are singin’ and the lightning bugs are floatin’ on a breeze. 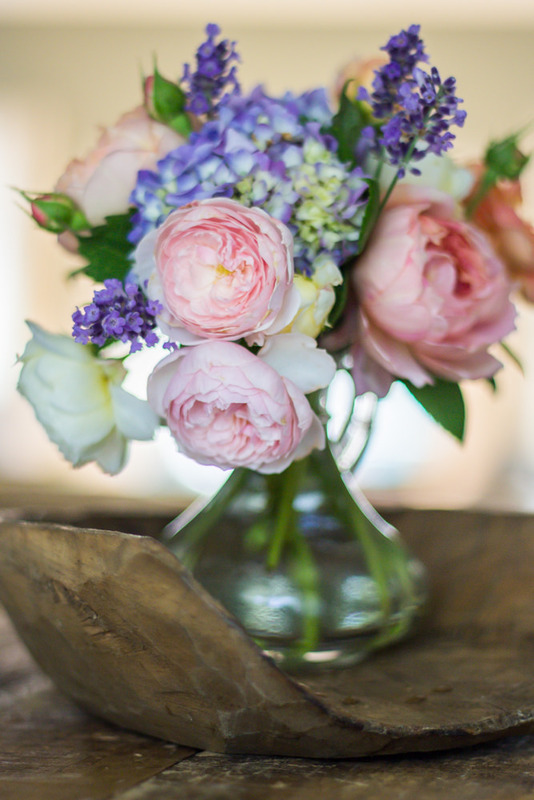 So baby, get ready… it’s time to start gathering those early summer flowers to put in a vase. My roses are usually in full bloom by Mother’s Day in mid-May, and they make for some AH-mazing flower arrangements. 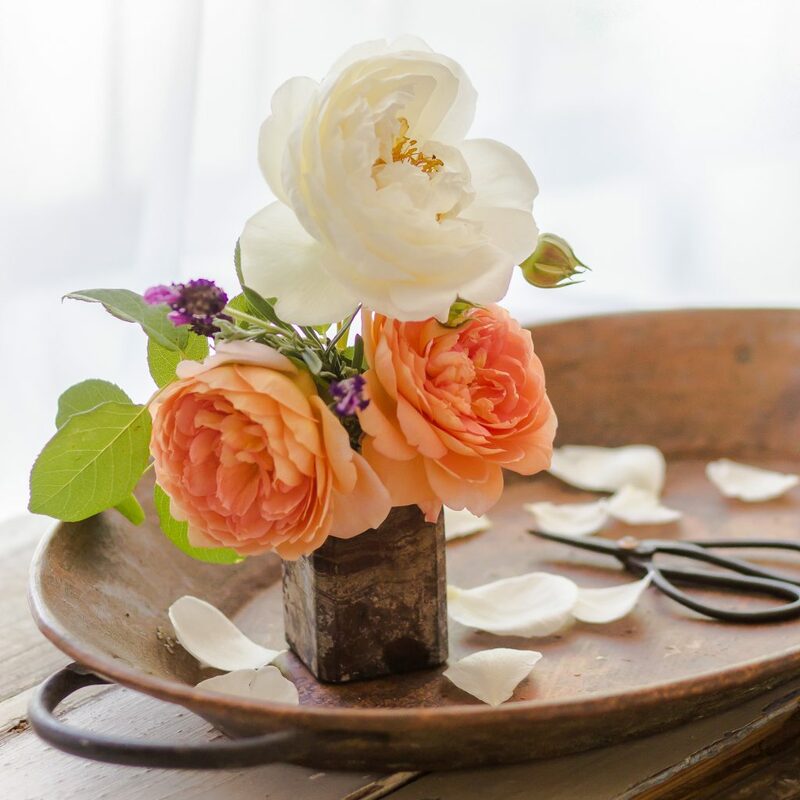 I grow David Austin roses but let me say right now that they are fussy, delicate, short-lived, floppy-headed little suckers that are prone to the dreaded Black Spot, so you might want to go for a hardier variety or long-stemmed type of rose if you want them to be longer and stronger for your bouquets. 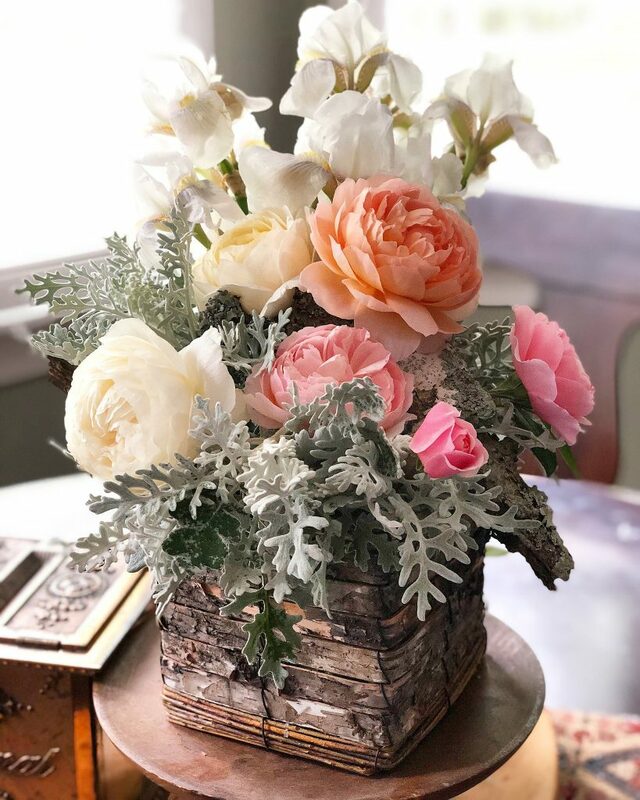 But, I must say that my David Austins have given me TONS of eye-candy photographs of floral arrangements, so I cannot complain about them too much. The varieties that I grow are ‘Carding Mill’, ‘Claire Austin’, ‘Lady Shallot’ and ‘Darcy Bussell’. 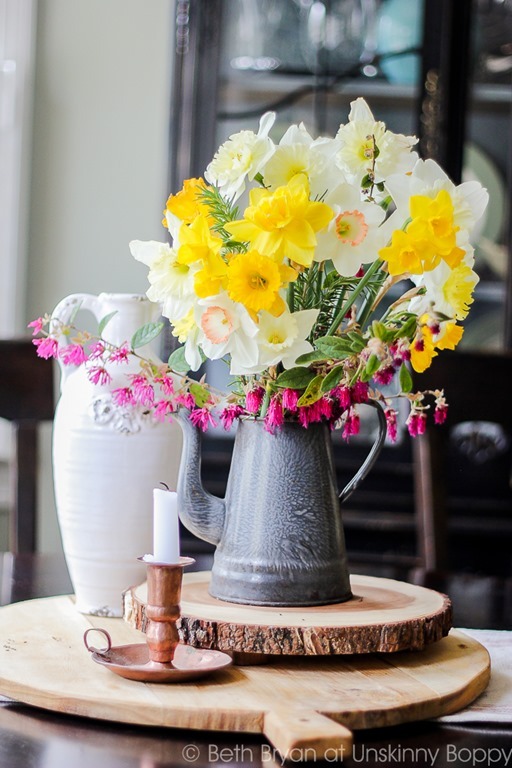 But they are just as beautiful as a dainty stand-alone flower arrangement as well. Oh, and they smell HEAVENLY. OK, OK… I hear you. Enough about the dang David Austin roses already. 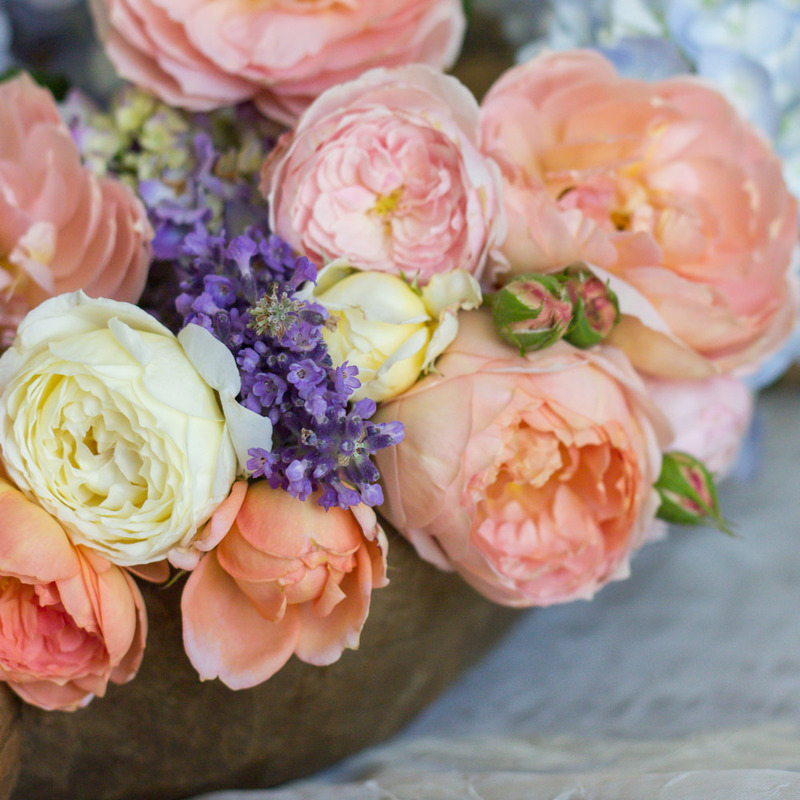 Let’s talk about a few more summertime faves for floral arrangements. Gladioli are long, skinny sabers of blooms that look SO amazing in a tall vase. Cut a bunch of these from your garden and you’ll feel like a Jedi wielding a light saber of loveliness. 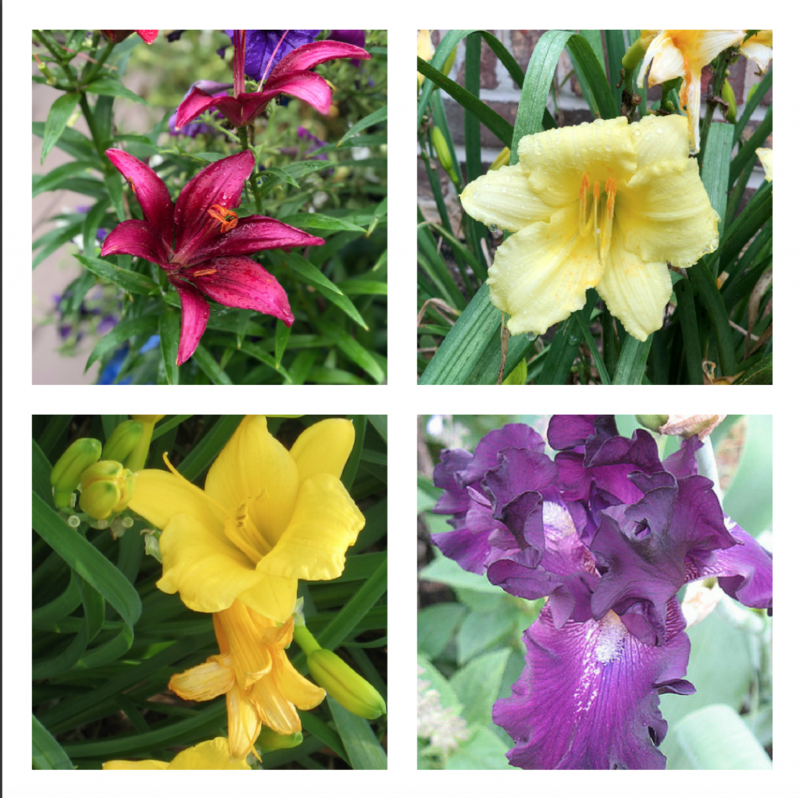 Other long, tall plants that are very easy to grow are Asiatic lilies, daylilies and bearded irises. Both ‘Stella d’Oro’ and ‘Happy Returns’ Daylilies provide bright yellow flowers that are perfect in a cut flower arrangement. 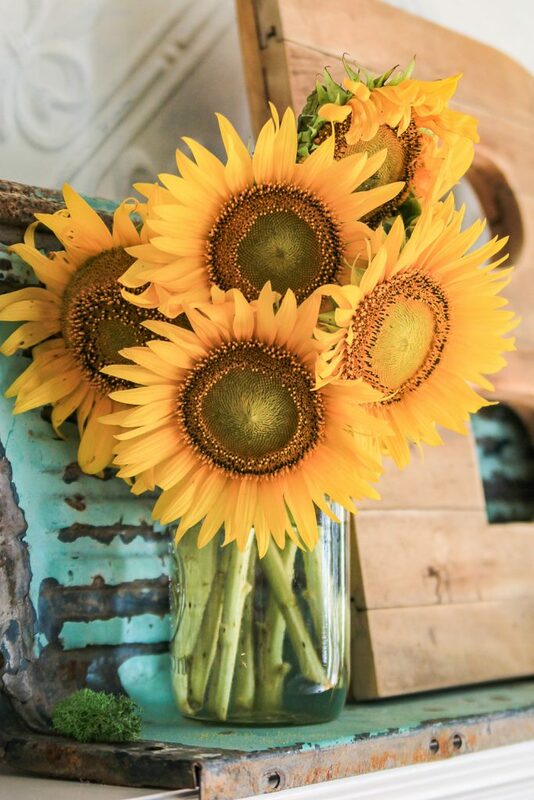 And, for amazing late summer blooms, we cannot forget SUNFLOWERS! If you haven’t already, be sure to read about my trip to a huge sunflower farm last summer. It was maybe the prettiest place on earth. Most certainly the prettiest place in the middle of nowhere, Alabama. Ok, sunflowers make the perfect segway into fall, because they could easily be considered a fall flower as well if you plant them late enough and your weather holds out. 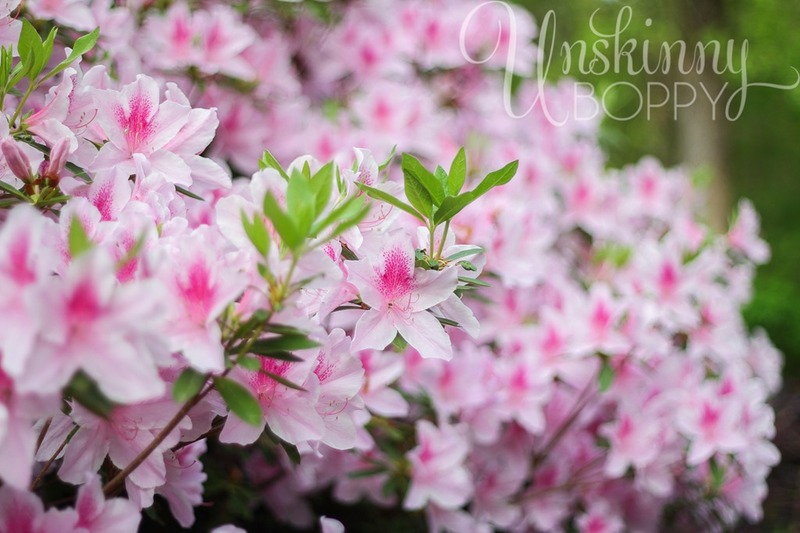 Lots of these plants in this post have overlapping seasons, so you’ll have plenty of time to enjoy them throughout the year. Every October garden centers across America fill up with giant pots of Chrysanthemums. They bloom in the fall in all the traditional fall colors- yellow, orange, red and purple and I’m not gonna lie–they sure do look great beside a big ol’ pile of pumpkins. But, for the love of all things fallish can we focus on some new flowers for a minute? 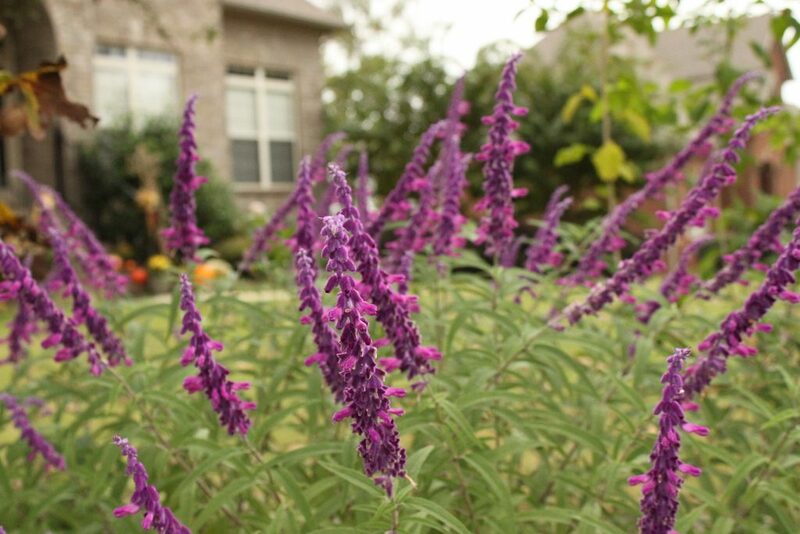 Like this amazing Mexican Sage Bush that still looks friggin fantastic in the cooler fall months? 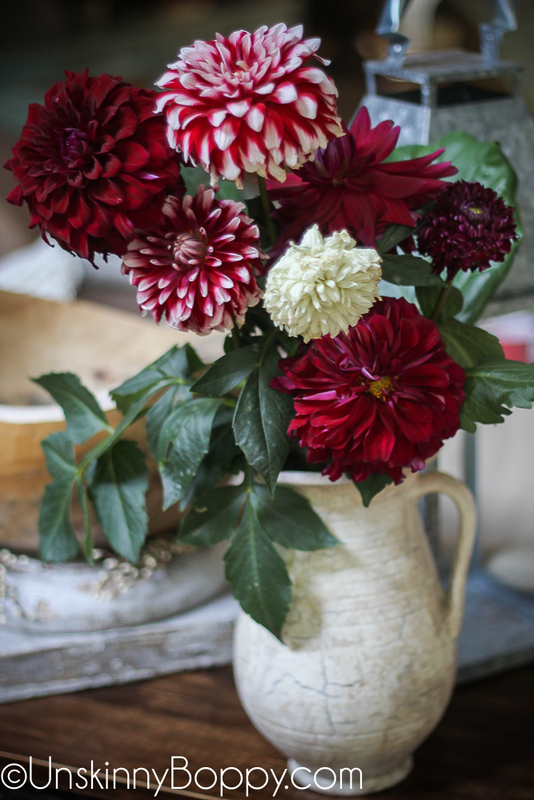 Or these CRAZY BEAUTIFUL dinnerplate sized Dahlias that I bought at the Farmer’s Market one fine fall day and never got around to blogging? Ohmahgosh they were absolutely stunning!! Or how about berries?! Berries are perfect for the fall. I had a fall wedding with all the traditional fall flowers, and my bouquet was full of Hypericum berries. I heart ’em. I had a volunteer Beautyberry bush at my old house that put out the most unique purple berries every fall. Just cut a bunch and stick them in a vase with some sprigs of rosemary for a unique fall arrangement. My neighbors at the old house had both a Gingko tree and a Golden Rain tree right on the street in front of our house. The Gingko leaves turned a brilliant yellow in the fall, and the Golden Rain tree produced these beautiful clusters of Chinese-lantern looking pods that were beyond beautiful. Man, I miss those trees. Have you ever seen an Osage Orange tree? 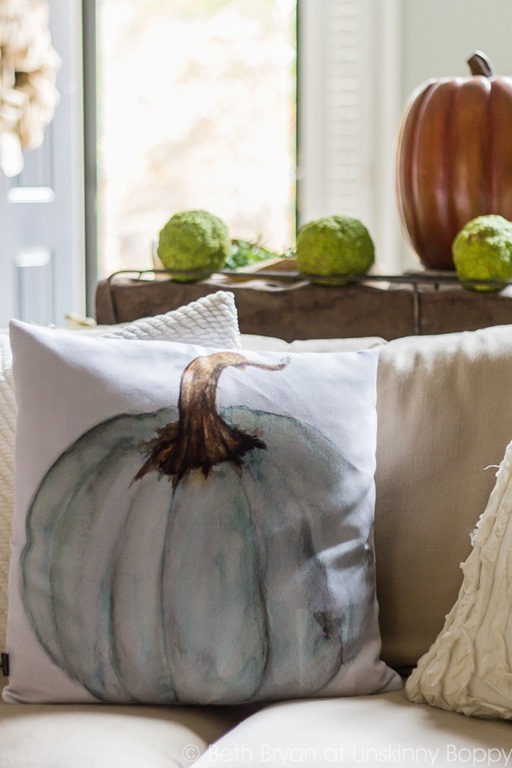 They drop these big green lumpy balls in the fall that just beg to be displayed in your house. It’s not exactly a “cutting” but it’s still really cool decor straight from nature. You can see them in the background of this picture sitting on my sugar mold. They could also double as creepy shriveled brains in your Halloween decorations. 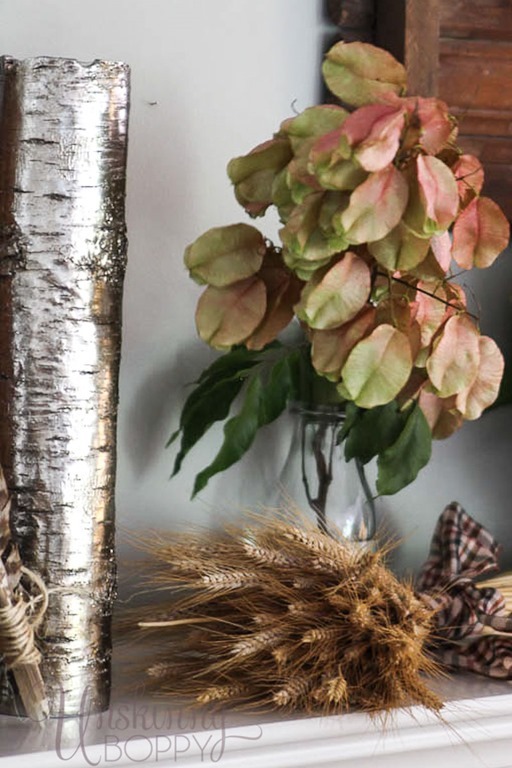 It may seem like mums have become fall’s official flower, but there are TONS of other plants that can flourish in your fall floral arrangements. 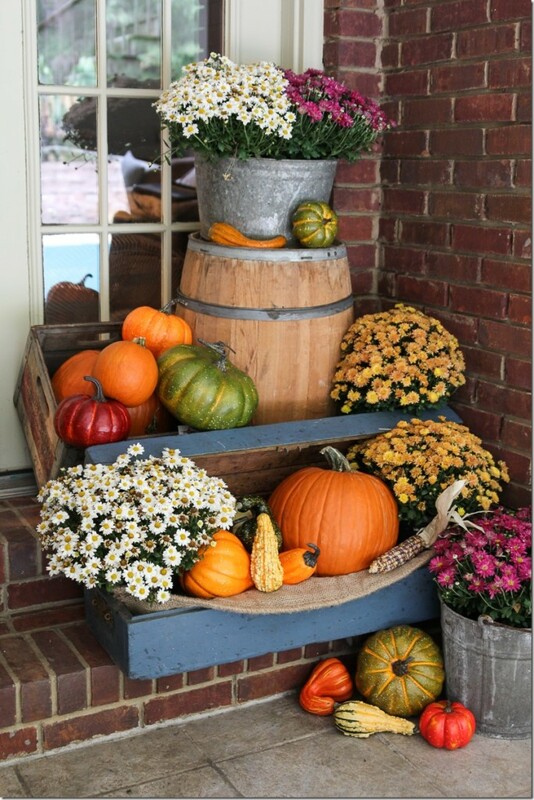 If you are tired of planting plain old garden mums every fall, you might be interested in my Mum-Free Fall Decorating post for lots of ideas. 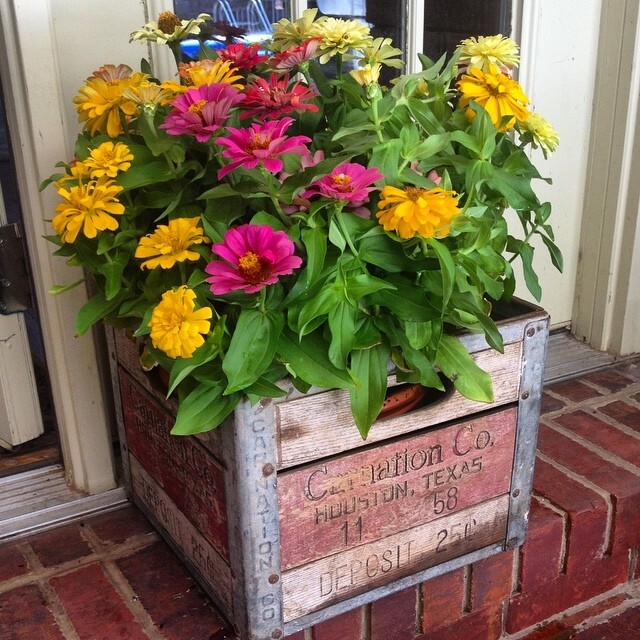 Andplusalso Zinnias in a Carnation milk crate. 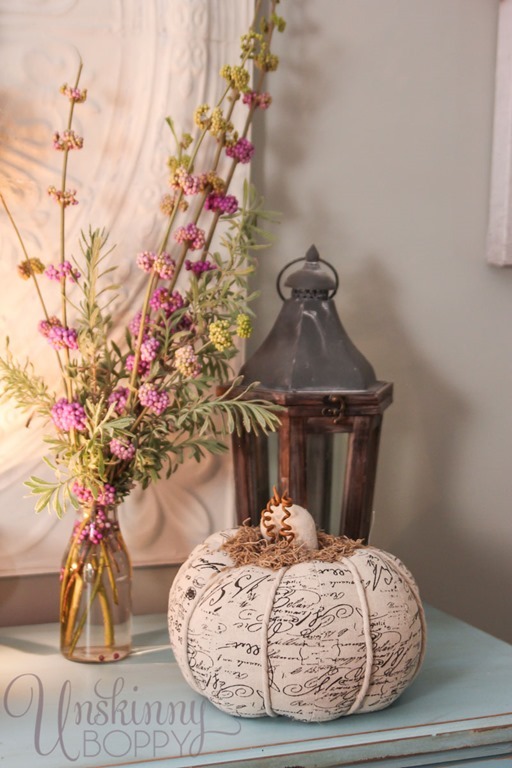 Ain’t nobody cutting off some janky old Chrysanthamum clippings and displaying them in a vase on their table. And finally, we arrive at Winter. Now, there are not many flowers worth cutting in the winter, so we’re gonna have to get evergreen-y up in here for this season. 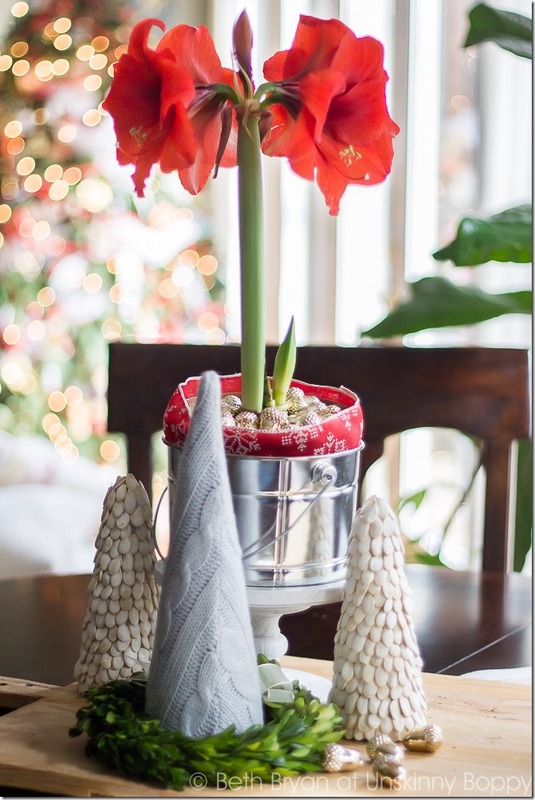 Poinsettias are predictable but this amaryllis is amazing, amiright? 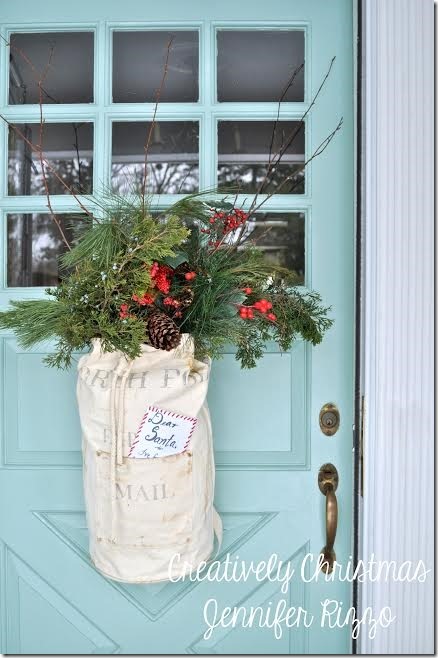 Winter is a time to deck the halls with boughs of holly, so let’s fa-la-la-la-la on over to Evergreen land. 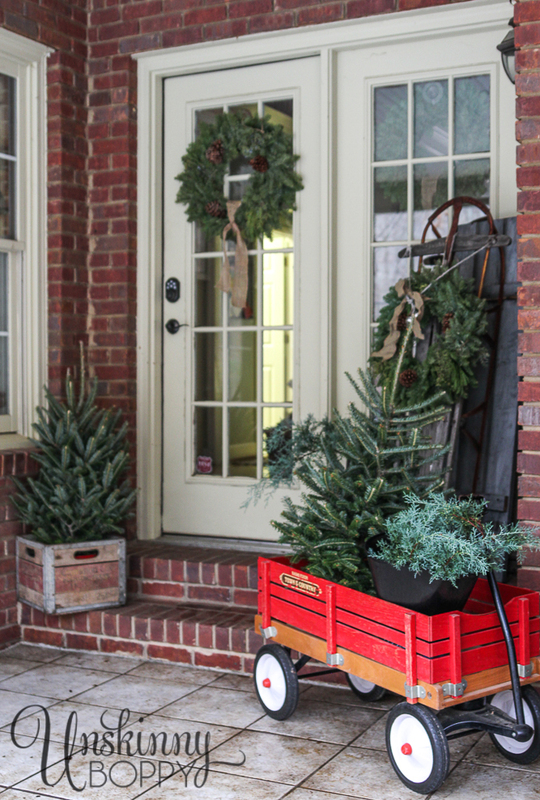 My friend Jen Rizzo nailed the evergreen clippings for her Christmas doorway. 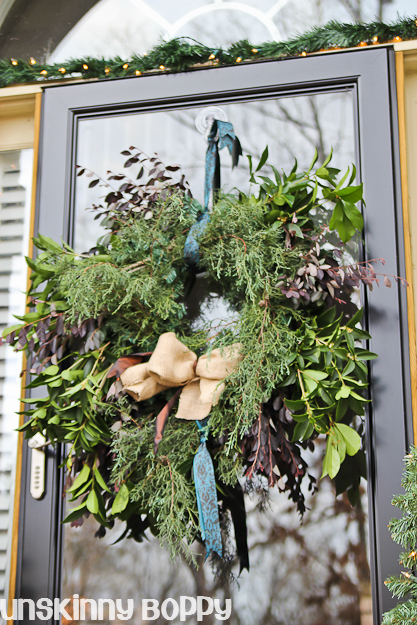 Back in 2011 I created these semi-evergreen wreaths using Leland cypress, tea olive and loropetalum clippings. I loved this big messy wreath so dang much! Now that I have inundated you with an insane amount of gardening information, I’d love to hear your thoughts on my picks for plants in a cutting garden. Do you agree with my choices? Have I forgotten anything? Leave me a comment below and let me know! 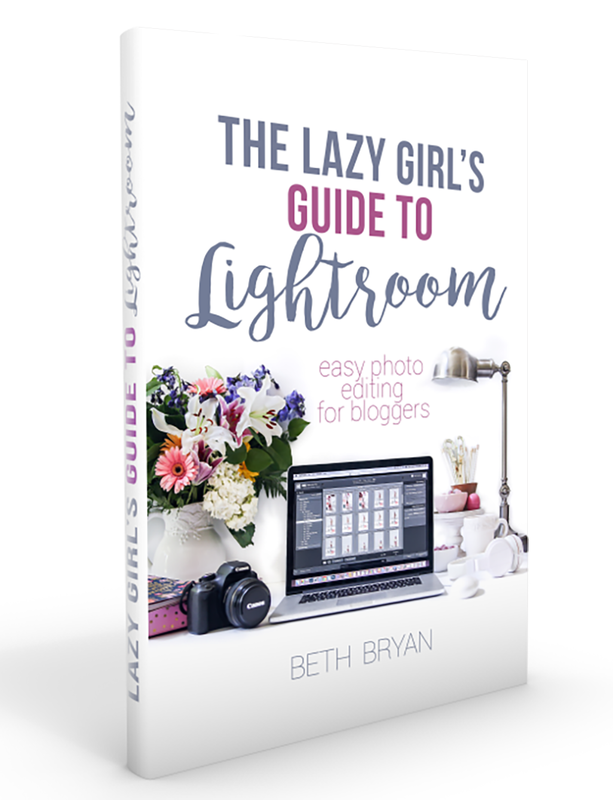 Great post Beth! How about Gardenia! Mine smell so sweet by the front steps! Thanks for some wonderful ideas! Thanks so much, Linda. And YES, how could I forget about gardenias? I love that smell soooo much. I appreciate your feedback! Thanks for commenting. What a lovely, colorful post! Do you happen to have any tips or tricks for those of us in the desert southwest? I would love a cutting garden, but we always have to watch our water usage. My granddaughter and i are currently babying some Creosote seeds,but sadly, they aren’t cooperating? Asking me for advice about gardening in the desert Southwest is about the same as asking me for advice about gardening on Mars. I am totally clueless! So sorry I don’t have more advice to offer you– maybe my DIY succulent wreath tutorial might interest you? Wonderful and thorough list, Beth! Your David Austin roses are gorgeous. I keep intending to plant some every spring. One new thing that I did plant a few weeks ago are white sunflower seeds. I’ve never grown any so it will be interesting to see how they do. Ooooo I haven’t heard of white sunflower seeds? That sounds very interesting! Keep me updated on how they grow- I’d love to see pics! Wow, completely gorgeous. Thank you so much for all the tips, fabulous flowers and how to make outstanding arrangements. I love this post. Great list! Something that occurred to me while reading this is to think more about the colors I’m choosing and when they will bloom. I stand in front of Dahlia tubers in the spring and tend to pick pastels but dahlias don’t bloom till late in the summer when I would prefer richer shades. This year I’ll try deep reds and burgundys. Thanks!